House and time at Malvern: No 4, 1911 - 1916. Died: 26 April 1918 aged 20 in France. Died of wounds. Born: Feb 17th 1898. Son of Stansfield and M. Anita Richardson, Thornholme, Sunderland. Upper V—Science Form. Minor Scholar. School Prefect. Great War, 2nd Lieutenant Tank Corps; transf. 4th Bn. Grenadier Guards. 'Many Malvernian friends will deplore the death of Raymond Richardson, who succumbed on April 26th to severe wounds received in action on April 20th. 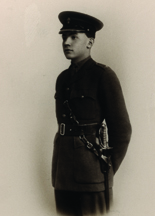 On leaving school he would, under normal conditions, have proceeded to Cambridge, but in July 1916 he entered a Training Battalion, and was gazetted to the Tank Corps in the following December. In July, last year, he was transferred to the Grenadier Guards, and went to France in December. He was a thoughtful boy, with a lively and engaging manner, a personality who would have to be reckoned with in any community. His opinions, firmly held, were expressed fearlessly, and always with the utmost good temper. With his interest in scientific developments and in modern industrial conditions, and with sympathies quickened by the struggle in which he was to lay down his life, he bade fair, had he survived, to prove a worthy successor to his father in a career dedicated to social service.' (Malvernian, Jun 1918). He was wounded on 22nd April 1918 and died four days later at a casualty clearing station half way between St Omer and Hazebrouck known as Ebblinghem. 'Le Tir Anglais. 20th April (Saturday). Battalion formed working parties. 2/Lt Richardson severely wounded. This officer subsequently died of wounds on the 25th April.' (Unit Way Diary).